During this off season it is important to remember the people who work to preserve and improve Edisto so that our generation and those ahead of it can continue to enjoy this special place. That’s why we are dedicating this month to more than sharing vacation rentals or your favorite eateries. There are more important things being done by local organizations, and the top of the list for us is Learning Through Loggerheads (LTL). Learning Through Loggerheads is a non-profit organization dedicated to the protection of the threatened loggerhead sea turtle. The group focuses specifically on the turtles and nests on the beaches of Edisto Island. Much of LTL’s work is done on beaches at Edisto. Meg Hoyle and Susan Ford, the spearheads behind Learning Through Loggerheads, offer educational programs for visitors. You have probably seen the slogan “Lights Out for Loggerheads” around Edisto. 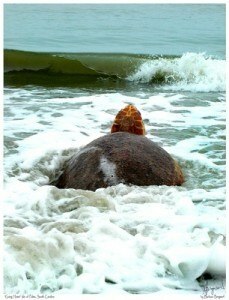 LTL shares an in-depth understanding of the Loggerhead and how we stay out of their way in the reproduction process. If we dont pass along information and knowledge we put the turtles at risk, Hoyle said. In that spirit, Learning Through Loggerheads offers an education opportunity that local middle and high school students would otherwise not have. Students serve as interns during the summer months where they actively participate in all aspects of the loggerheads protection. This educational program provides students from all walks of life with an opportunity that instills a lifetime love of learning and appreciation for the environment and conservation and ensures that future generations will continue to protect the sea turtles. For some students, this carries over into college and beyond. LTL does so much to preserve the environment we all enjoy and much more. That’s why we are offering everyone the opportunity to give a few bucks to an organization that helps continue our way of life. From all of us at Edisto, consider making a small donation to Learning Through Loggerheads by clicking the PayPal button below. This is an excellent way to show your year-round support of Learning Through Loggerheads, education in the Lowcountry, and the Edisto Beach community. $5 or more and you get a free EB sticker. $25 or more and you get a free EB sticker AND a free shirt. $50 or more and you get 3 EB stickers and 3 shirts in any size. Stickers and shirts are donated at no cost to LTL and are not deducted from donations. Learning Through Loggerheads is a non-profit organization on Edisto Beach that is dedicated to protecting loggerhead sea turtles. Find out more about the program by visiting LTLonline.org. If you love this cause and have given any amount, please leave a comment below. Our friends at LTL appreciate anything you have to say.